The thing that amazes me about veterans is their ability to put up with some of the most challenging situations that any individual can face. You can put them in any environmental condition, expose them to extreme levels of psychological stress, and yet they’ll still keep moving forward. To many veterans, this is both strength and liability. I’ve often thought about how to describe the military culture to those who have never served, and it is challenging. There is a saying that veterans have: to those who have been there, no explanation is needed; to those that have not, no explanation is possible. After the end of the draft, fewer Americans have served in the military, or have had direct family members who have served in the military. With each successive generation, our nation’s direct experience of veterans is diminishing. So bear with me while I attempt to provide some explanation. The citizen enlists in the military. The reasons for this are many; to get out of a dead-end town, to serve your country, because your father/mother/uncle/brother served, to pay for college, to see excitement, adventure, really wild things. For some, to be honest, it is as much of a running-from as a running-to, a way to break the chains of the environment that they find themselves in. 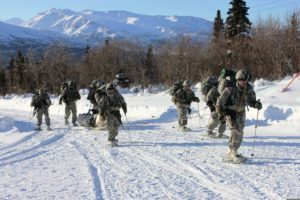 Once they get to basic training, though, the reasons and motivations that brought them there become secondary to the task of transforming a civilian into a military service member. We can debate all we want about the horrors of war or the necessity of a standing military, but the truth is that there has always been a need for warriors in any society, and there always will be. Basic Training, Boot Camp, is the transformative process that creates those warriors. Not everyone makes it through initial military training. While the self-selecting process begins with enlistment, it continues throughout the service member’s career. When I went through Basic Training in the early ‘90s, there were plenty of ways to get out of the military. Some were behavioral…break enough rules, and you were out…and some were psychological. While the desire to quit was often present, the actual act of quitting happened rarely, and it was of course not celebrated. Sometimes stuff happened, like an injury, that caused someone to be discharged against their will. Each of these come together in complex and challenging ways, to the ultimate result: those who completed basic military training were those whose internal or external environment would not allow them or did not require them to quit. After a service member’s basic training, they are sent to advanced training. For some, the advanced training is intertwined with their basic training, but for many, it is a separate process. Basic training gives military service members exactly that: basic military skills such as weapons familiarity and marksmanship, physical conditioning, discipline, marching, things like that. In addition to all of those things, however, each service member has an occupational specialty in the military: driving trucks, collecting intelligence, engaging in combat, hundreds of other advanced specialties. Again, this is a selective process; while a service member may have passed through basic training, they may not be able or willing to meet the requirements of the advanced training and are then sent to do something else; but quitting happens relatively rarely. This process of enduring hardship continues through a veteran’s time in the service, whether it is five years, fifteen years, or twenty-five years plus. Each of us has our own individual capacity for enduring hardship, and it’s often much greater that we actually realize; military service stretches individuals by putting them in situations that provide hardship beyond their known capacity but within their actual capacity. Throughout any one particular veteran’s career, there are thousands of choices to do or not do, pursue or not pursue an opportunity. As I mentioned before, however, it is this capacity for hardship that is both a strength and a liability. If a veteran who has experienced the admittedly minor hardship of basic military training, they may feel as though they can accomplish even more. After all, that’s the point of stretching beyond our known limits. The challenge comes when the knowledge of success drives desire for future success, or the understanding of our capacity to endure hardship causes us to inaccurately assess the impact of future hardship. Essentially, the attitude becomes, “since I handled that, I should be able to handle this.” What I believe may happen is that, after enduring much hardship and challenge, we come to believe that our ability to endure future hardship is greater than our actual capacity to endure that hardship. At the beginning of the veteran’s career, they are not aware of the limits; they think that their capacity for endurance is much less than it actually is. After experiencing hardship, however, they then begin to achieve much closer than their capacity, and then they still are not aware of their limits, but in the opposite way: they think that their capacity for endurance is much more than it actually is. A brief illustration from my own career. In the late 1990’s, I was stationed at Fort Bragg and served with the 82nd Airborne Division. It was, and remains, one of the most fulfilling assignments of my career, and was formative to my development as a leader. Among many other things, I jumped out of airplanes. A lot. The last six months I was at Bragg, I jumped eighteen times. Often several times a week. Once, twice in one day. Typically, a paratrooper only needs to jump once every three months, but I was trying to get another level of qualification for my Jumpmaster badge. I achieved my goal a week before I left Fort Bragg for my second tour in Germany; of course, there were more immediate repercussions, one of which were four stress fractures that put me on crutches for six months a year after I got to Germany. I truly loved jumping out of airplanes, though, and spent a lot of time in my career trying to get back to that. Almost ten years after I left Fort Bragg, I came to Fort Carson, Colorado, under the assumption that I would be able to work with 10th Special Forces group and jump out of airplanes again; didn’t happen. The Army had other plans. The possibility of returning to the Airborne community was closed; but six years later, when I am contemplating retirement, had already enrolled for my Masters in Counseling program, and was considering what life was like after the military, THEN the Army decides to give me what I had been wanting since 1999: the opportunity to jump out of airplanes again. Go figure. I was excited. It actually delayed my retirement plans for two years. Finally! I was remembering the fun times of 25 years old, the rush of excitement, dawn on the drop zone, the sense of pride and accomplishment that comes with being a paratrooper! Of course, I was NOT remembering those cracks in my leg, but they had long since healed, and it wasn’t going to get that bad again, anyway. A lot of things changed between 1999 and 2012: not just thirteen years, but three combat tours, and about twenty five pounds. I thought I would jump right back in to where I left off, pun intended; but time, age, and gravity, had other plans, just like the Army did. I used to be able to jump three times a week, but recovering from a jump when you’re 25 is much easier than recovering from a jump when you’re 38. There was no way that I could have physically endured the pace of jumping that I did in the late ‘90s, although mentally I both thought I could and wanted to. At 25 years old, my own perceived capacity for hardship was less than my actual capacity; at 38 years old, my perceived capacity for hardship was greater than my actual capacity. It was only after another injury on a jump, and then two more jumps to confirm what I didn’t want to admit, did I come to the realization…my jumping days were over. And yet I still survived. Thrived, even. Some of the most amazing experiences I had in my military career happened in those last three years of working with 10th Special Forces group. All of the stress, all of the pain, was absolutely worth it. Even the life lesson…realizing that I overestimated my capacity for hardship…was invaluable. If you’re working with veterans, and you experience resistance or self-condemnation in them where they think they should be able to handle whatever’s going on in their life, understand that they were trained that way. They may not be aware of it. And very often, a veteran’s capacity for awareness is actually much more than they think it is.